If you are planning to install into an existing Exchange Organization, there should be no 2007 version or earlier in the Organization. 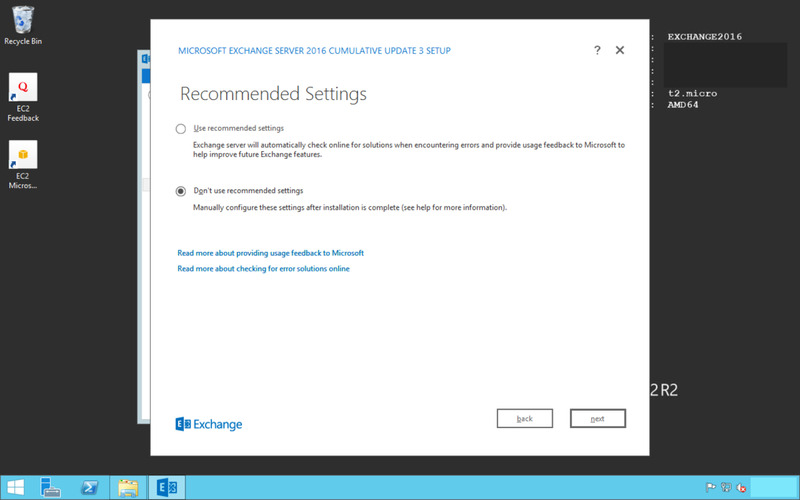 If you have Exchange 2007 or earlier, then unfortunately you would have to upgrade to Exchange 2010 first. 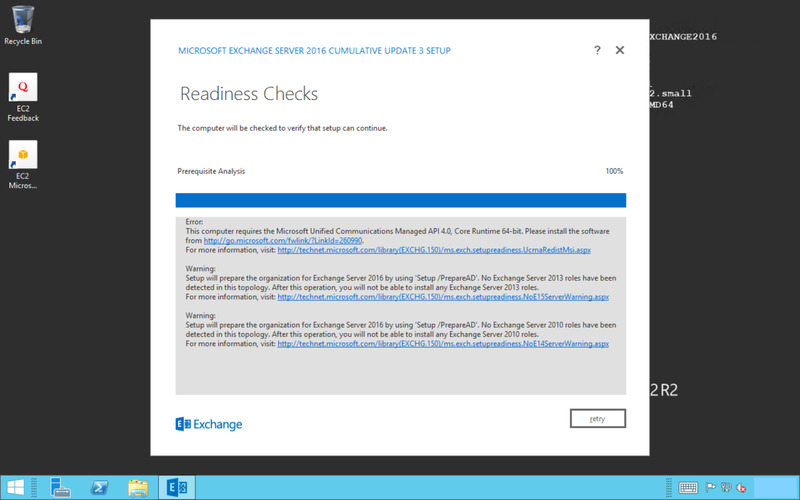 This would involve you installing a new Exchange 2010 server into the existing Exchange Organization and then migrating the mailboxes to the Exchange 2010 server. Once all the mailboxes have been migrated to the Exchange 2010 server, you can then decommission the Exchange 2007 or earlier server before you can install Exchange 2016. The domain and forest functional levels need to be Windows 2008 or later. All Windows 2003 domain controllers must either be upgraded or demoted. 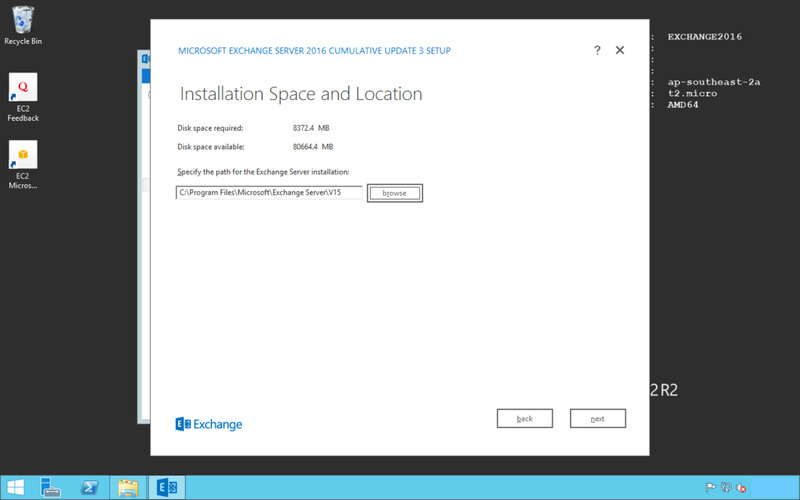 The server you are going to install Exchange on MUST be part of the Active Directory domain. 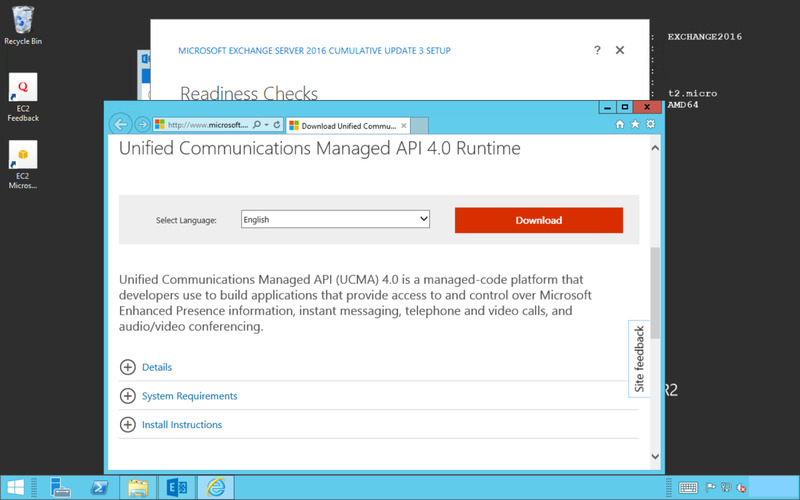 Microsoft didn’t specify the exact requirements but my recommendation is 2 Virtual Cores minimum. The page size on the Exchange server needs to be set to the size of the RAM plus 10 MB, to a maximum of 32 Gigs if using more than 32 Gigs of RAM. 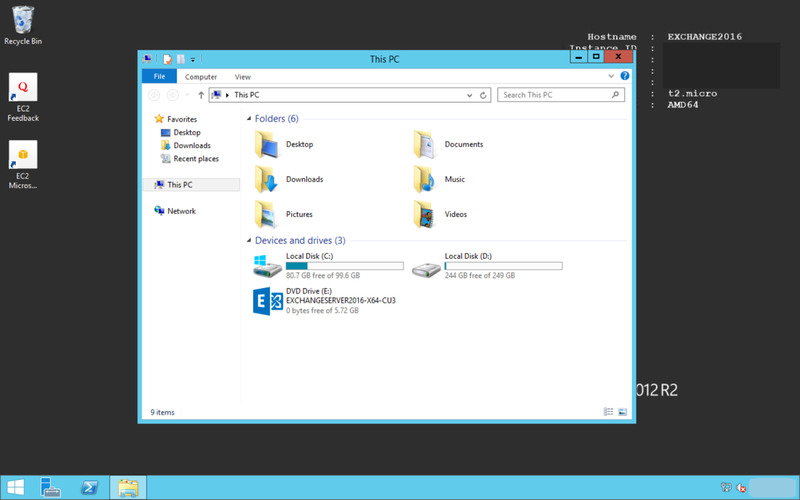 30 GB minimum on the drive which you will install Exchange. 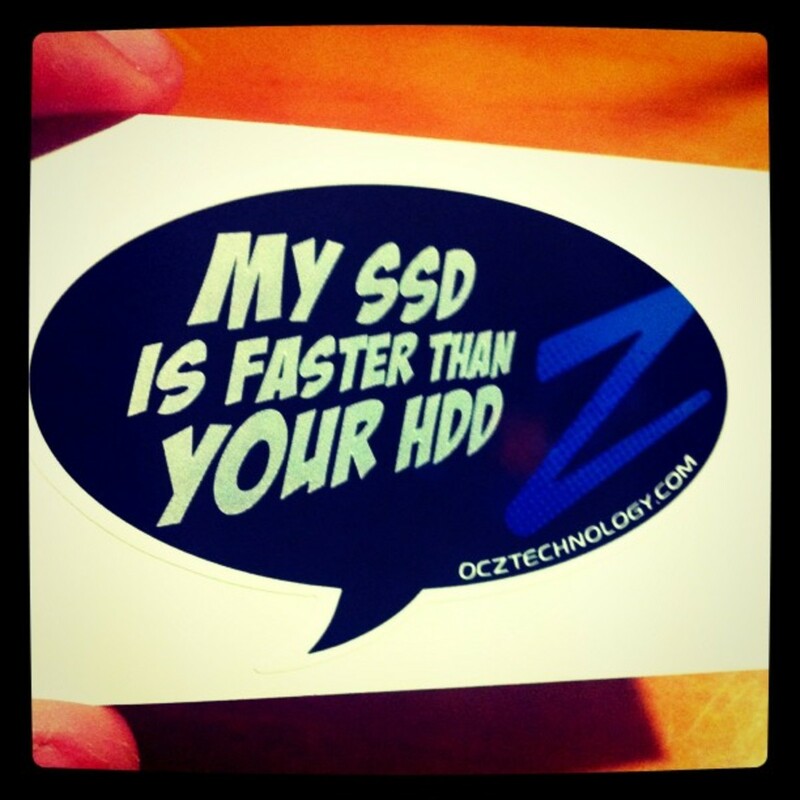 200 MB minimum of available disk space on the system drive. 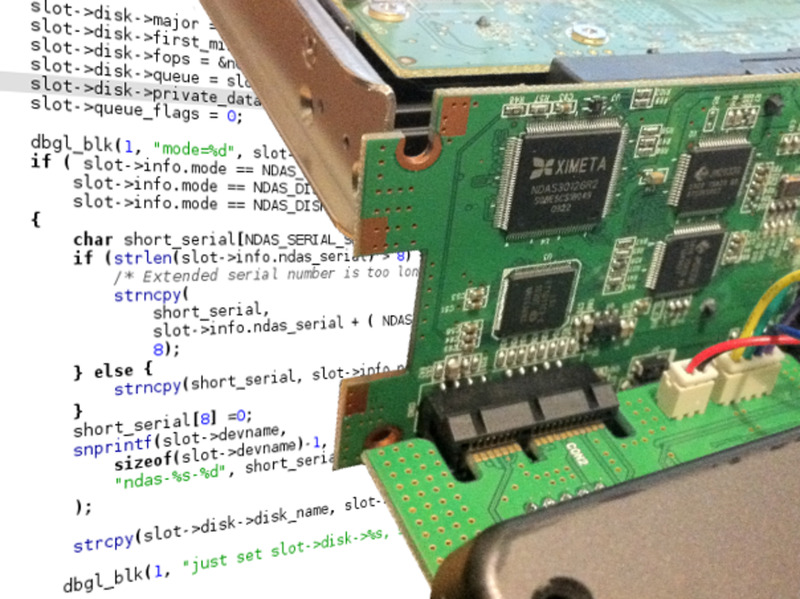 500 MB minimum of available disk space on the hard disk that stores the message queue database. 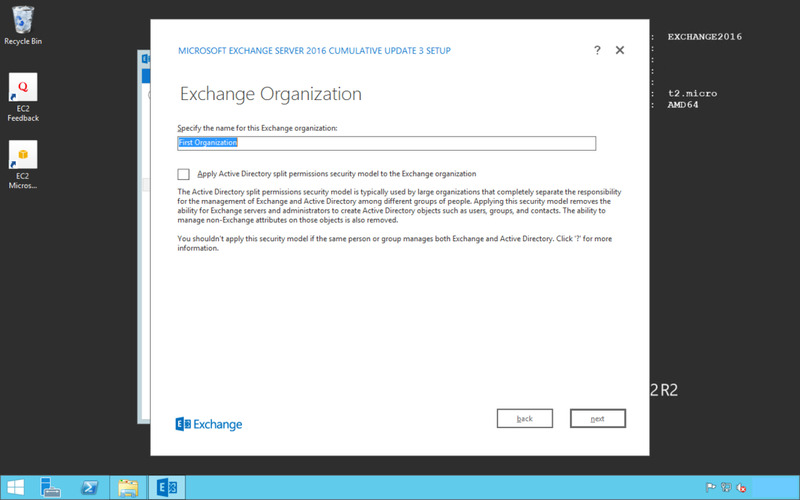 Exchange 2016 supports the NTFS file system. It also supports the newer ReFS file system for partitions containing transaction log files, database files, and content indexing files. 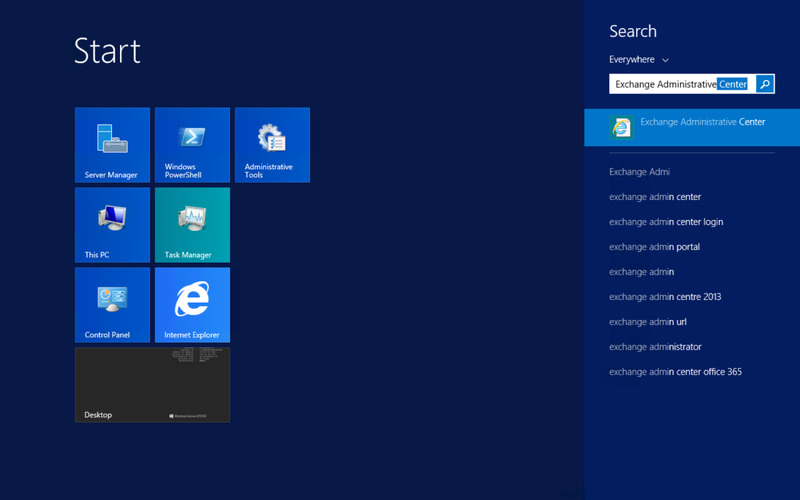 The Exchange 2016 Management Tools can also be installed on the 64 bit versions of Windows 8.1 or Windows 10. 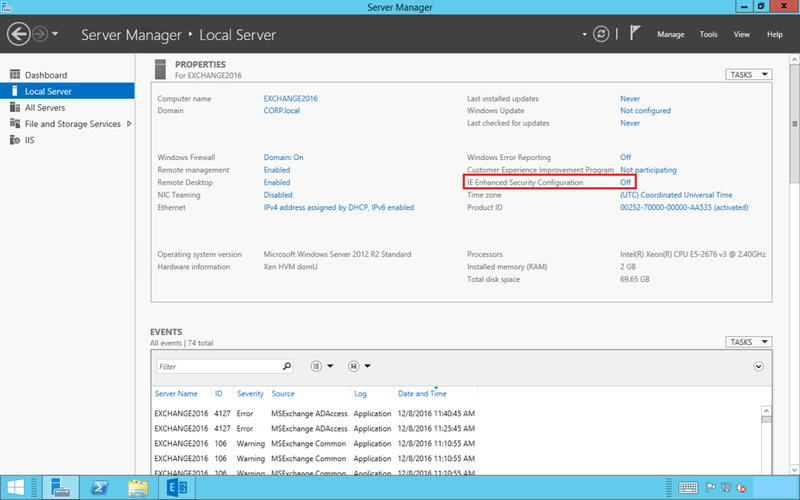 Windows Server 2012 or later must be running in Desktop Experience mode i.e. GUI mode. If you have installed Windows Server 2012 or 2012R2 in Windows Server Core mode, you can issue a PowerShell command similar to the below to change it to GUI mode. 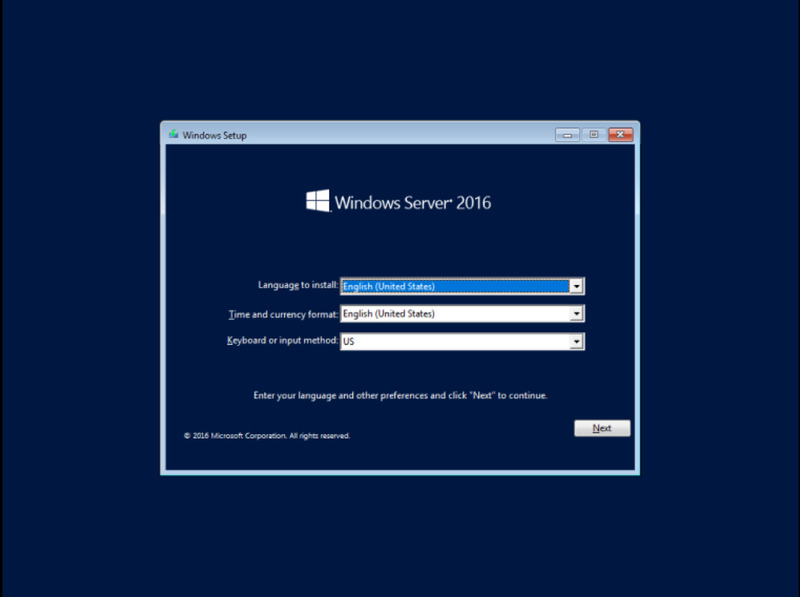 If you have installed Windows Server 2016 as a Standard installation, which is the equivalent of server core, or have installed Windows Server 2016 as a Nano server, then you will need to reinstall the operating system before being able to install Exchange Server 2016. 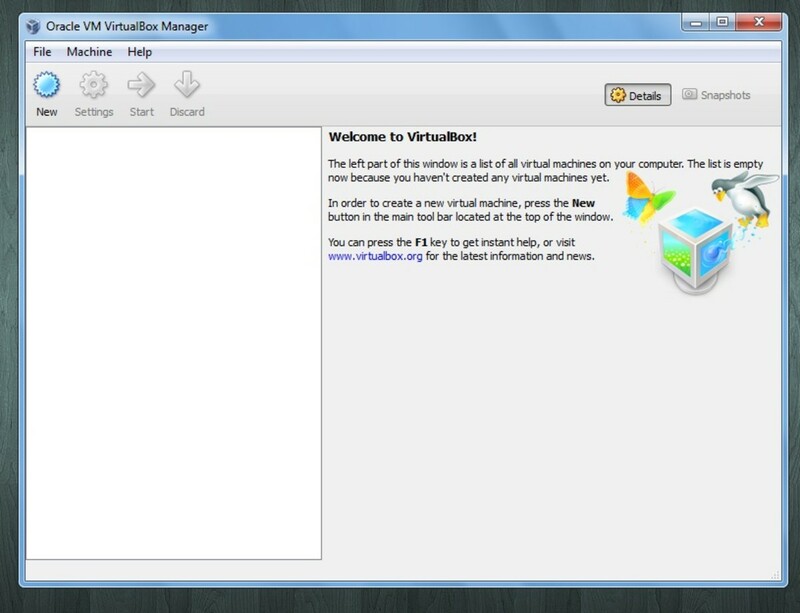 You will need to select the Desktop Experience installation option during setup. Insert the DVD, open up the drive in explorer and run Setup. Setup will ask if we want to Check for Updates. Let’s select Don’t check for updates right now and click next. We will select Don’t use recommended settings and click next. 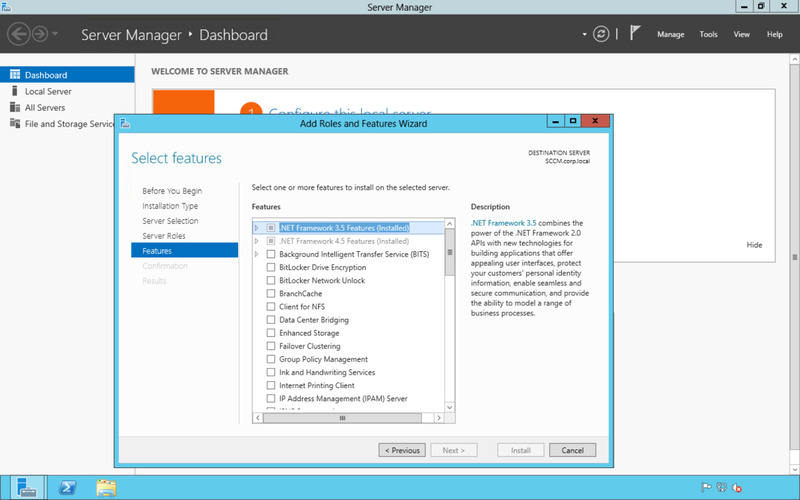 We will select the Mailbox role, and Automatically install Windows Server roles and features that are required to install Exchange Server and click next. Note that in Exchange 2016, when you select the Mailbox role, it will by default install the Management tools and grey out the Edge Transport role. The Edge Transport role is usually installed on a server that will sit in a perimeter network, providing secure mail flow in and out of the organisation. For our purposes, mail will flow directly in and out of this Exchange server. Select the installation location. In this case, we’ll leave it on the C drive. Normally you would create another partition where you will install the Exchange application to. 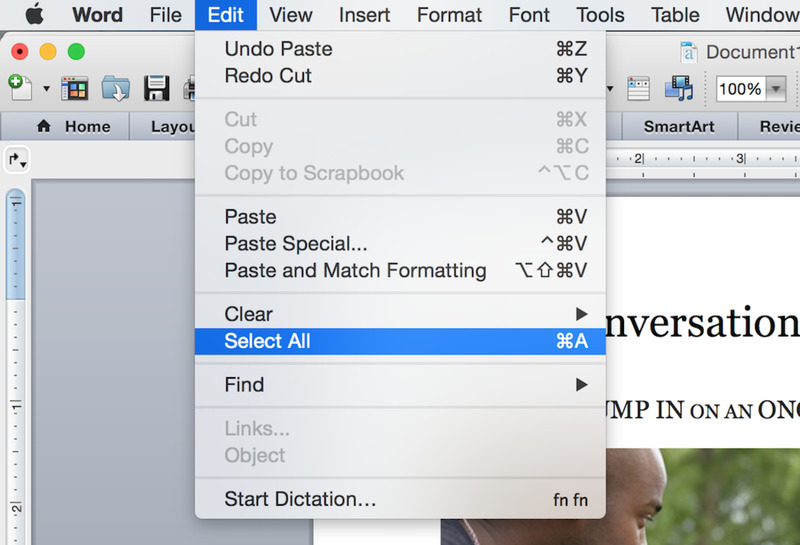 Specify the name for your Exchange Organization. Normally this would be the name of your company but in our case, we will be uncreative and call it First Organization. 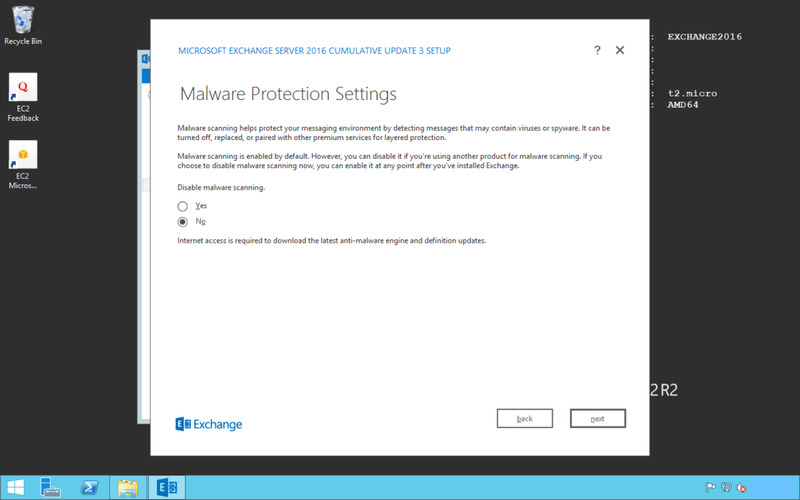 DO NOT tick Apply Active Directory split permissions security model to the Exchange organization. You would use this if your organisation was large enough so that groups of people are allowed to create Active Directory user accounts only and another set of people are allowed to setup Exchange mailboxes only. Malware scanning is enabled by default. However, it will prompt you to allow you to Disable malware scanning. Choose No, and click next. The Exchange setup will now start to verify if setup can continue. It will also start to install any required features or roles since we had told it to do it automatically. The setup will now respond back with a list of tasks that we need to perform in order to be able to continue with the setup. The first step is to reboot the server for new roles and features to take effect. We will restart the server, and follow the preceding steps again, and look at the next list of tasks that we need to perform for the Readiness Checks. After restarting the server and going through all the preceding setup steps, we should get another Readiness Checks message like below. 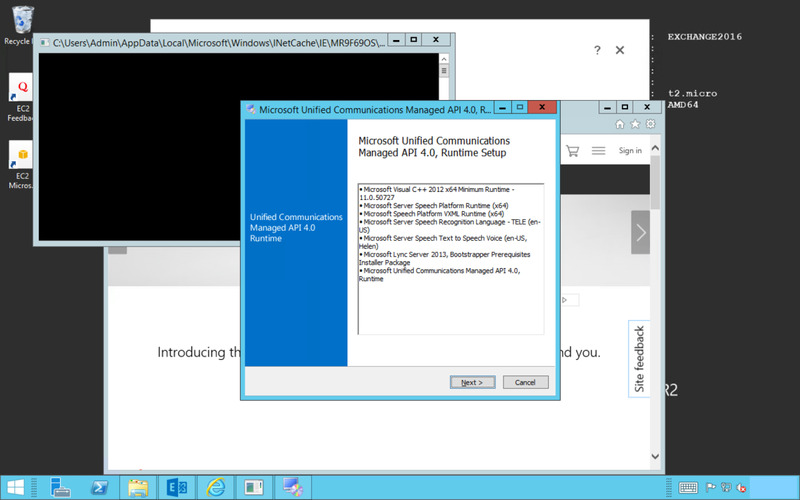 We only now have to install the Microsoft Unified Communications Managed API 4.0. This can be downloaded from the link given in the error message. 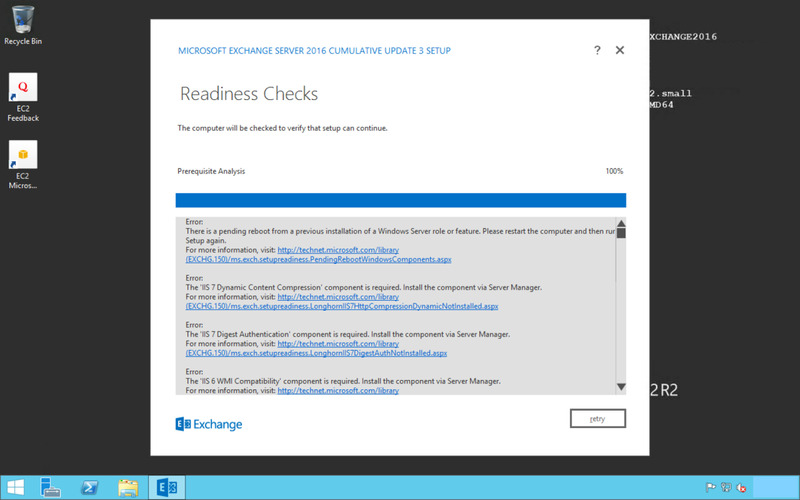 Make sure to leave this Readiness Checks message window opened. After we install the UCM API 4.0, we can then just click on retry . If you are doing this from the server itself, you must turn off Internet Explorer Enhanced Security otherwise it won’t let you do a download. 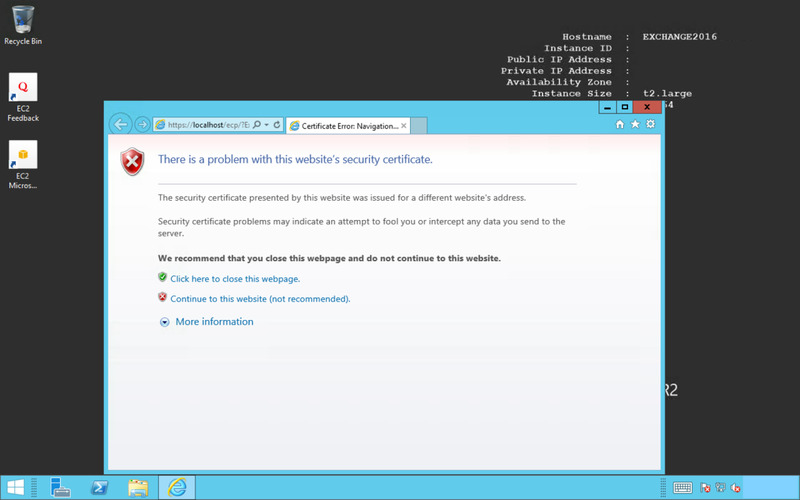 To turn off Internet Explorer Enhanced Security, go to Server Manager, and select the option to turn it off. After clicking on the link, click Download and save the installer. Then run it. If you had closed the previous Readiness Checks message window, then you would need to go through the setup steps again. If you had left the Readiness Checks message window open, you can now just click on retry. We should now be presented with an option to install. We can safely ignore the warnings because we neither have Exchange 2013 nor Exchange 2010 in our Exchange Organization. 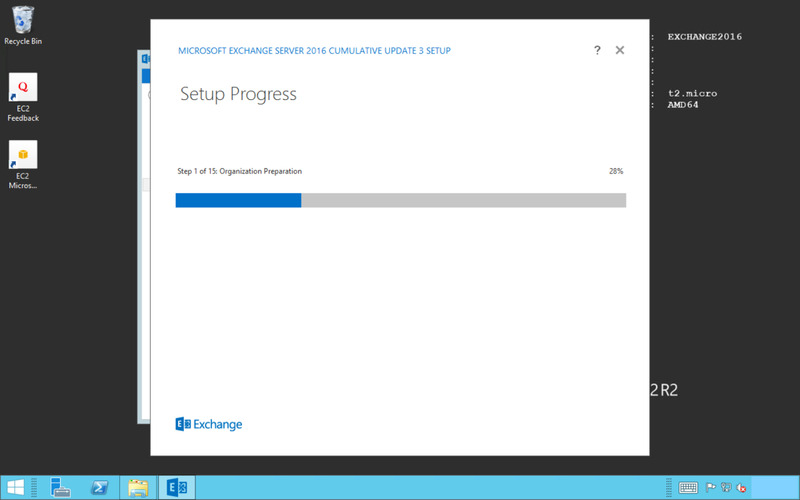 This will be the first Exchange server. 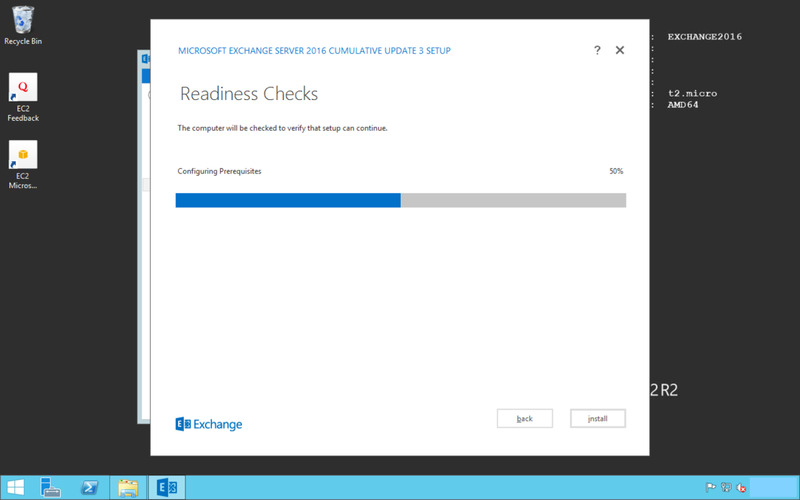 The setup has completed, but we need to restart the server to complete the Exchange server installation. 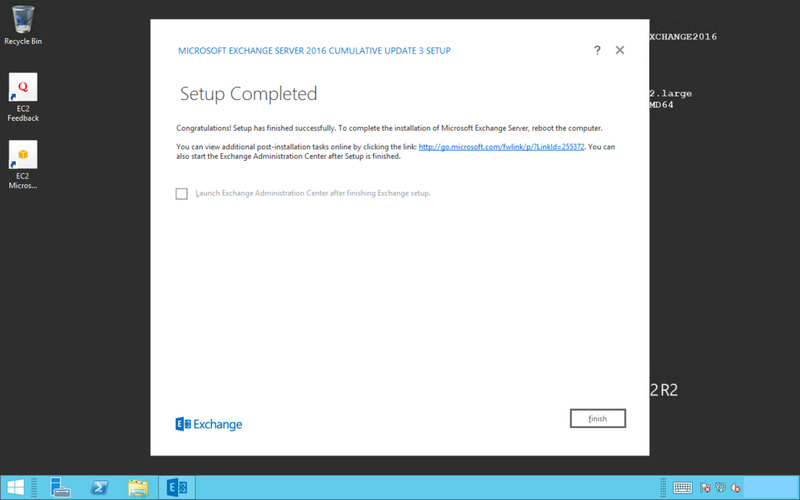 Once the server has restarted, log into the server, and connect to the Exchange Administration Center. 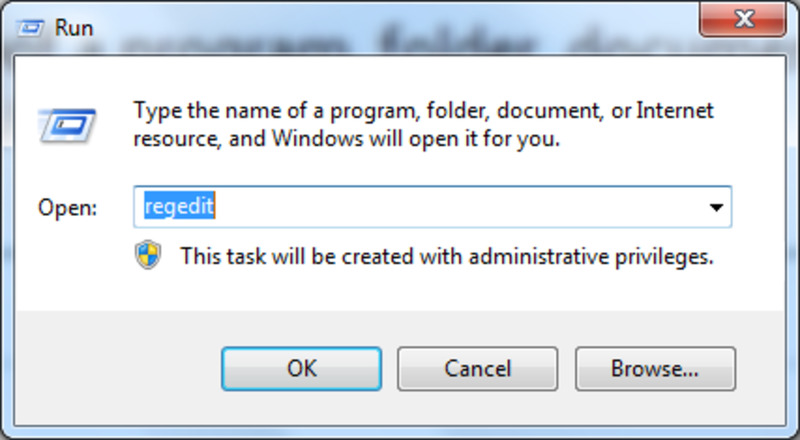 This can be achieved by clicking the Windows Start button, and typing in Exchange Administration Center. Click Continue to this website (not recommended) and ignore the warning. We know that this is a safe site. 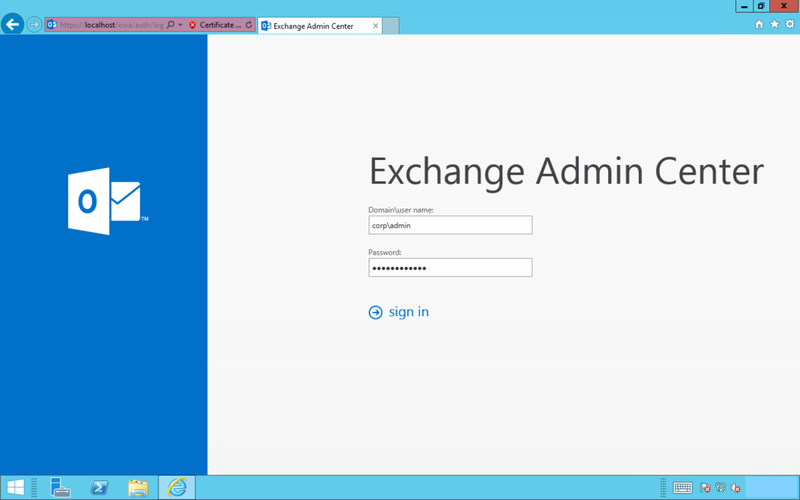 Log in with the Administrator account that you had previously used to install Exchange. 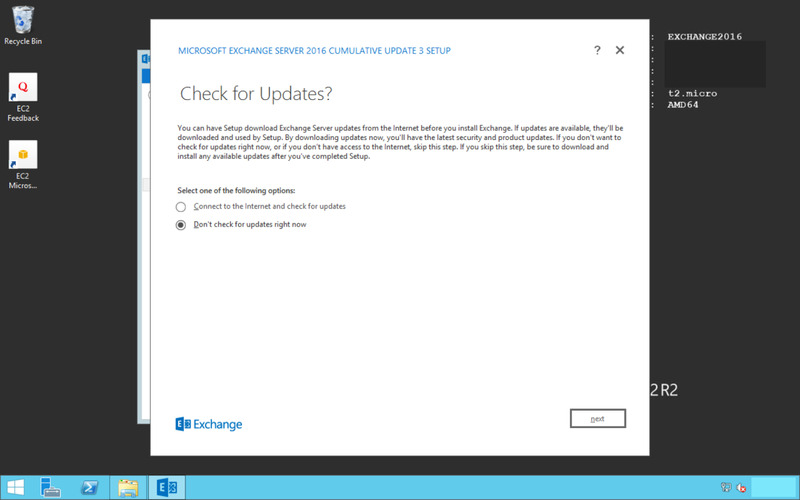 We have now installed Exchange Server 2016. 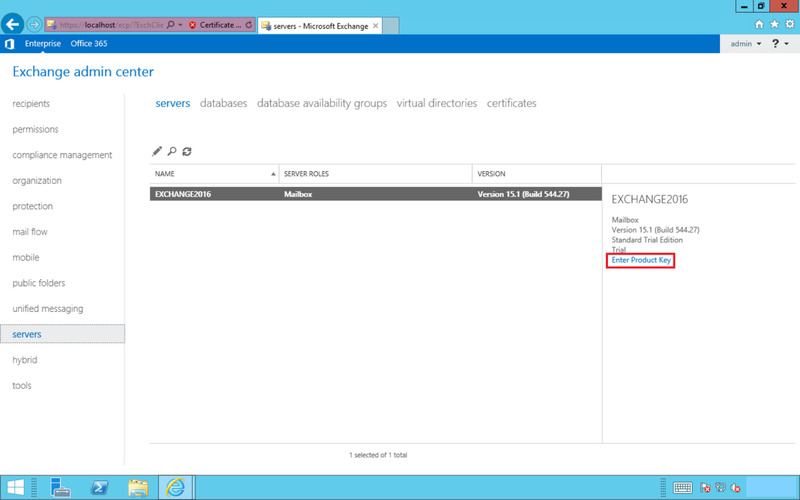 We have verified that the Exchange server has been installed correctly by logging in. You can now create mailboxes. 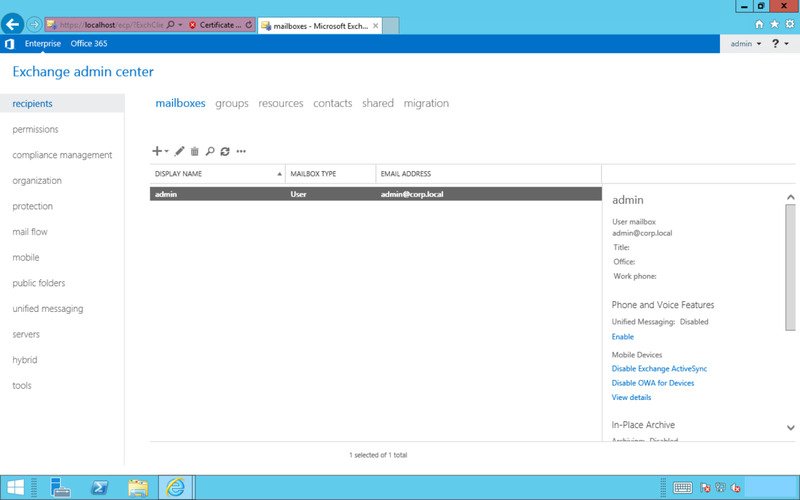 However, in its current state, you can only send and receive e-mails between the mailboxes on this Exchange server. We will need to do some Post Installation Tasks to enable our server to communicate with the outside world. 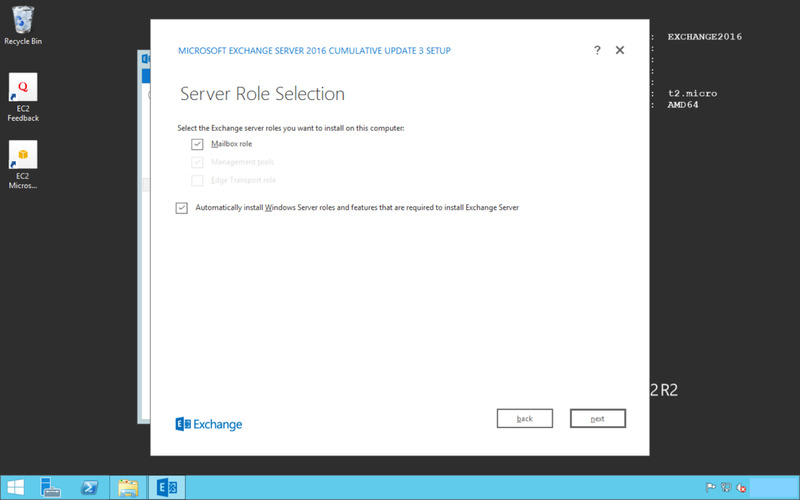 In the next tutorial, we will look at configuring the Exchange server so we can send and receive emails with the outside world.